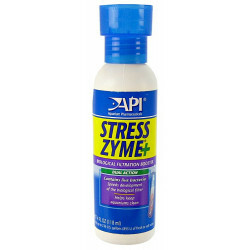 API Stress Zyme Plus helps improve the development of the biological filter, as well as cleaning a dirty aquarium. API Stress Zyme contains millions of live, beneficial bacteria cultures to break down and destroy sludge in the gravel bed while keeping grass and plants clean. API Stress Zyme Plus breaks down organic compounds that can cause dangerous conditions such as ammonia and nitrite poisoning and low oxygen levels. Directions: Shake well. To maintain a clean, healthy aquarium: add 1 tsp. (5 ml) per 10 US gallons (38 L) or 1/2 cup (120 ml) for each 240 US gallons (912 ml) of water weekly. For new aquariums to help boost the biological filter: double the dose, use at startup and for 2 additional weeks. I have no complaints using it as directed. I have been using this product for about a year now and it is hands down one of the finest products on the market for fish. First thing, it's an "API" product. After getting out of fish keeping for quite a few years, a lot had changed as far as products on the market. They had really expanded! I tried a few API products and was hooked. They go above and beyond anything I had ever used before. This is an awesome product that I will not be without! I have a pond where I keep my Koi. We were expecting a very harsh winter, so we decided to bring them in. We set up 2 x 50 gallon tanks and brought them in before the ice formed on the pond. We added the Stress Zyme to both tanks and the fish are doing well. Since the fish are pretty large, we have to replace volumes of the water with fresh water. We just add more Stress Zyme and things have been going great. We also use Stress Zyme in our pond to keep our Koi healthy. Works great, I doubled the dose at start up on my 75g tank. I now use on a regular basis every other water change. Helped cycle my tank much faster and my fish are happy. My fish are doing GREAT!!! My fish were in a corner not moving I knew it was the water. I follow the instructions on the Stress Zyme Plus. Now my Platys, Catfish,and zebra danios are doing much better. Swimming back and forth. 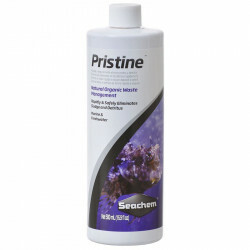 This product is great for tropical fish. This is the first time I've used this product. I have 3 tanks and none of them go a week without a dose! One tank is an Oscar (which can be very messy fish) and there is never a mess in the gravel! 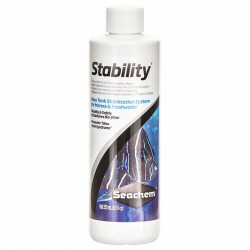 All of my fish are very happy and their water conditions stay at perfect levels with this stuff! I have used just about everything from API from the Stress Zyme to the Ammo Lock and they are a wonderful brand!!! Highly recommended for proper tank maintenance, especially during filter pad replacements. Stress Zyme is very useful for aquariums. Every aquarium owner ought to have this. 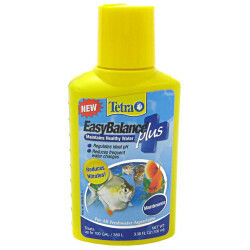 I use this product every time I do water changes, adding new fish or just topping-off my 28G aquarium. Fish stay healthy and disease free. Helps keep my aquarium water crystal clear. Petmountain sells these cheaper than local pet stores. Petmountain is great!